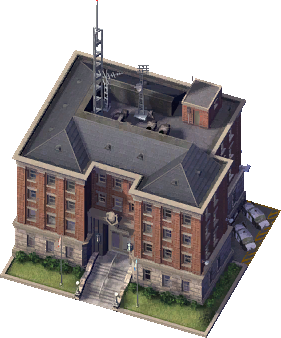 The Large Police Station is a Civic Building that provides Police Protection for your Sims. The Large Police Station is the second most expensive and effective Crime-fighting solution in SimCity 4 Rush Hour/Deluxe (The most effective and expensive in the base game), with an increased monthly cost, more dispatchable cars, a stronger crime-deterring effect and a wider coverage area than the Small Police Station. It is positioned above the Small Police Station and below the Deluxe Police Station in Crime-fighting power and facilities. The Small Police Station is a direct downgrade and the Deluxe Police Station a direct upgrade. The original name for this building was probably the 36-Car Local Precinct before being changed to Large Police Station as its exemplar still contains this name. This possibly happened because it doesn't have 36 dispatchable cars.